Men are surprisingly taught very little about how to take care of their skin. We check in with Dr. Jeffrey Benabio on some things every guy should know about the largest organ in the body. You’ve lived with it your whole life. You’ve rubbed it, scratched it, picked it, and burned it. You’ve shaved it, moisturized it, and massaged it. Your skin. You know it. Right? Or do you? Is it possible that after all these years together there are things you don’t know about your skin? 1. 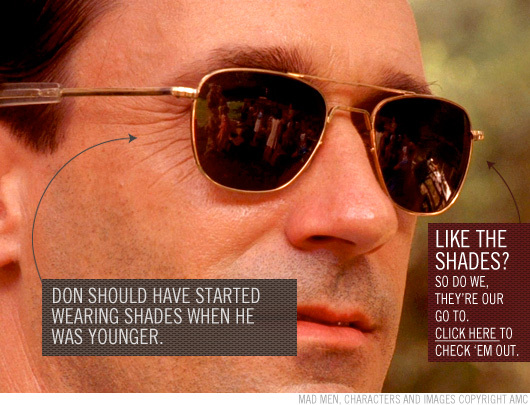 Sunglasses aren’t just for eye protection; they’re a defense against crow's feet. Guys even in their late twenties can start to develop wrinkles in between and around their eyes, which are caused by squinting. So if you spend a lot of time outdoors or on the water, take a hint from JFK and make sure to have on a good pair of dark sunglasses. You’ll look perpetually young and your older self will thank you. 2. Looking for an all-natural way to heal cuts? Try honey, (not your girlfriend) and not just any honey, but Manuka honey. Manuka honey has better anti-bacterial properties than other types of honey, which when applied to a cut, acts like an antiseptic, killing bacteria, reducing inflammation, and speeding up the healing process. In fact, recent studies have shown that Manuka honey actually kills MRSA, a highly resistant staph bacteria. Here’s how to use honey to treat cuts: Clean the cut gently with soap and warm water, then pat dry. Apply a liberal dab of honey, then cover with gauze and tape. Avoiding wetting the bandage, and change the dressing once a day. Then treat yourself to an Eldorado. You’ve earned it. 3. Acne is not caused from dirty skin. Acne is primarily a hormonal problem. Elevated testosterone levels are not only an issue of juiced up gym rats, but also a natural occurrence in guys in their late teens and twenties. Testosterone leads to increased sebum (oil) production that builds up under the skin creating acne bumps. Instead of over-scrubbing, use acne washes that contain either salicylic acid or benzyl peroxide which unclog pores and allow the sebum to escape. 4. If you’re a guy who prides himself on his close shave, think about taking a break once in a while. Giving your hair a chance to grow can help unclog pores and reduce ingrown hairs in just a few days. Plus, it demonstrates to your potential mate that you’re a healthy male who’s capable of siring children for her someday. 5. A man’s grooming should be as simple as possible but not simpler. If you’re using shampoo for both your hair and bodywash to save a few seconds in the shower, I’m telling you, it’s not worth it. Shampoos are designed to get oils off your hair; when you use them on your body, you strip needed oils off your skin. Two weeks of that, and you’ll have lizard legs. 6. What’s the fastest way to spread warts on your hands? Chew your fingernails. Nail biting causes tiny tears in the skin on your fingertips and nail beds which provides a massive hole in your front line defense that viruses can easily pass through. What’s the fastest way to turn a girl off in a bar? Show her your chewed up, warty fingers when you go to buy her a beer. 7. Those spots on your skin showing up in your ‘old age.' “Liver” spots are brown spots on your hands and arms and are not related to the liver at all, well, except for being the same color. They’re actually sun spots caused by excess sun exposure over decades. They tend to be worse on the left arm and hand since that’s the side exposed to sunlight when you drive. Unless, of course, you’re an avid right-handed golfer, in which case, your glove hand usually looks better than your right hand. If your skin has been exposed to the sun, you will get sun spots as you age. Though you may not like the look of them, fortunately, they’re almost always benign. The only way to prevent sun spots is to wear sunscreen regularly, to avoid getting too much sun, and to keep your skin covered with clothing. As always, this isn't medical advice – consult with your doctor. Dr. Benabio is board certified in dermatology and is a fellow of the American Academy of Dermatology. Get more skincare tips on his blog, The Derm Blog. Great advice, I never thought about the shaving problem either. Good topic. I’m in Colorado and the dry air, sun, and altitude combined with my forced-air heater have been wreaking havoc on my skin this winter. This past week I finally had enough and made some lifestyle changes that will hopefully have good results – shorter, cooler showers, patting dry instead of rubbing dry, moisturizing right after showering, drinking lots of water, and taking fish oil pills. I’ve seen some modest improvement already. I’ve never really trusted those “hair and body” washes. I don’t even like the combo shampoo/conditioners. I mean, who’s THAT busy? One thing a lot of guys also miss is face moisturizer. It’s one thing to clean your face with the chemicals you mentioned (one tends to work better than the other, depending on who you are btw), but you have to replenish the moisture in your skin with an oil-free, non-scented lotion. You can even use an anti-acne type. This says acne caused by dirty skin, and then goes on to explain that it is caused by oil build-up clogging pores. Functionally this would seem to be pretty similar to me: washing your face more = have less acne. Dr Benabio is misinformed about #5. Almost all bodywashes contain a higher amount of surfactants (the active ingredient in liquid soaps) than shampoos. Bar soap can be even more harsh on skin than body washes. If we aren’t supposed to use shampoo, should not wash our bodies at all? The simple answer is to moisturize with a high quality lotion after a shower. As it turns out, philosophy is a lot more useful when you’re out in the real world rather than in a classroom. Learn from our mistakes: Dress your best by ridding your style of these 10 common errors. Whether chasing a villain through the streets of Milan or just moving your roommate's car out of the driveway, knowing how to operate a standard shift vehicle is an important life skill to have.